FREE audio book for you inside. A very short and very sweet, old-fashioned love story. 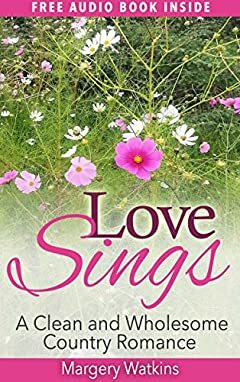 "Love Sings" is an old-fashioned love story about a sweet country girl who's just had her heart broken. Will she find that she can again experience pure, sweet love? The kind of love where someone will take care of her and love her for who she is? This is a Clean & Wholesome country romance. A hopeful, happy and fulfilling read. Read it for a boost to your day. It will leave you smiling and feeling uplifted. If you are a believer in old-fashioned romance, you'll love this little story. Per one reader this book "will give you a very happy feeling and make you feel good inside." Print Book contains preview to "Love Hopes". Please visit Margery's Author Page for more clean & wholesome and inspiring romances.